Single-layer graphene oxide (SLGO) possesses carboxylic and hydroxyl groups suitable for reactions with aliphatic or aromatic diisocyanate molecules. TEM analysis reveals that aliphatic diisocyanate molecules caused SLGO to scroll into star-like formations, whereas aromatic diisocyanate molecules retained SGLO in a flat-sheet morphology. TGA confirms the stabilisation of the formed urea and urethane groups on SLGO, but the onset of sheet pyrolysis occurs at a lower temperature due to isocyanate reactions with anhydride and epoxide groups embedded in the sheet. Pendant isocyanate groups act as bridging units to facilitate the attachment of pyrrole molecules, which are then used as anchor sites for the covalent polymerisation of pyrrole to polypyrrole (PPy). 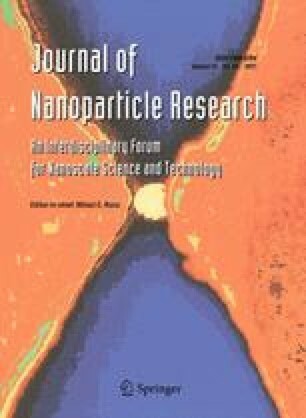 The use of FeCl3 as the polymerisation catalyst generated both covalent and free PPy, but also iron hydroxide nanoparticles were observed decorating the SLGO surface. When using ammonium persulfate as a catalyst and dodecylbenzenesulfonate as a dopant, free PPy could be removed under treatment with solvents to leave a purely covalent system. Discrete regions of SLGO were observed decorated with nanoparticles of PPy along the edge or across the surface of individual sheets. It was found that the flexibility of the SLGO sheet and the type of diisocyanate used directly affected the electrical resistance of the final composite. We thank the RCUK Academic Fellowship UK and the Marie-Curie Industry-Academia Partnerships and Pathways Agreement (FP7-PEOPLE-IAPP-2009-251429-UNCOS).